I love when airlines offer arrivals lounges at their hub airports. They’re a good way to prolong the premium travel experience, so the airline continues to take care of you until it’s time for you to get to your hotel. It means you have somewhere to go when your flight arrives at 5 AM and your hotel check-in is at 3 PM (for this reason, a lot of arrivals lounges are only open from 5 AM to 12 PM, and close for the remainder of the day). Cathay Pacific has long offered an arrivals lounge at Hong Kong Airport, located in one of the passageways between Terminals 1 and 2. The lounge opened in 2008, and is open all day, between 5 AM and 12 AM. It’s also open to everyone flying in first or business class on Cathay Pacific (read: not any oneworld airline), or oneworld Emerald members (Cathay Pacific Diamond and Gold members also have access) arriving on a Cathay Pacific flight. Unfortunately Cathay Pacific will be closing this lounge as of Monday, November 5. Terminal 2 is expanding, and Hong Kong Airport eventually hopes to operate flights out of it; as part of that plan, the area housing the lounge will be returned to the airport. 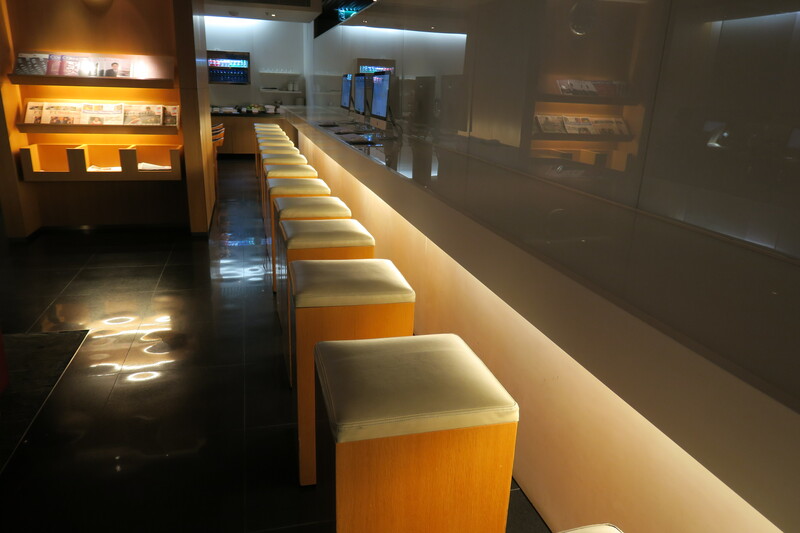 While Cathay Pacific has some of the most beautiful lounges of any airline out there (and I say this having visited many of the world’s best, and I tend to be unfairly critical on the airline), The Arrival is not one of their better lounges. The airline hasn’t been renovated since its 2008 days, and the lounge sure is a decade past its prime, with outdated seating and zero natural light. The lounge features a limited breakfast menu and showers, though I’ve heard bad things about the latter, since the shower rooms tend to have pretty bad ventilation. So I wouldn’t consider this a massive loss for the airline. I have to say that I didn’t know why Cathay Pacific bothered with an arrivals lounge in the first place. The lounge is sad, past its prime, and generally isn’t a good place to work. One of the things people like after getting off a longhaul is natural light, which this lounge features absolutely none of; the seating also isn’t great, and I can see the lounge getting cramped if it houses any more than 10 people at once (it was empty when I visited last). While it’s a good place to catch up on emails with a decent breakfast, there are good restaurants in the arrivals hall, and Hong Kong Airport features free, fast WiFi (not free showers, though). Overall my favourite arrivals lounge continues to be Virgin Atlantic’s at London Heathrow, which is much bigger, has more natural light, and features a spa as well as a much more extensive breakfast menu – it’s a much more fun and pleasant place to spend time.